Makai welcomes new users of MakaiPlan and MakaiPlan Pro. 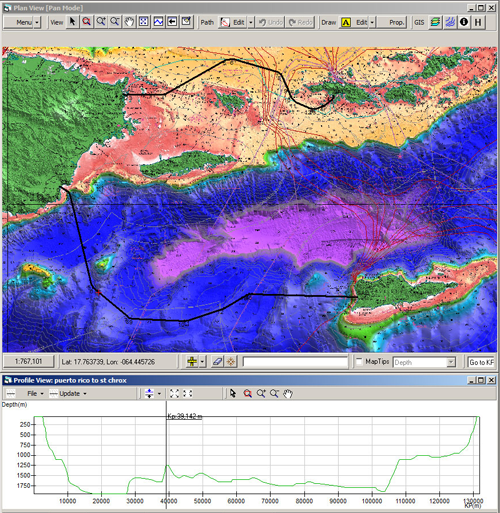 A screenshot of MakaiPlan showing the plan and profile views for a cable route near Puerto Rico. Makai made sales of MakaiPlan, GIS cable route-planning software, and MakaiPlan Pro, cable lay simulation software. Makai’s software continues to serve as the industry standard for cable planners and installers who serve the subsea telecom cable, power cable, and military markets. Fugro-Pelagos (USA) has purchased MakaiPlan with the MakaiDTM and MakaiFME modules. This system is being delivered to E-Marine, the principal provider of submarine cable solutions in the Middle East, at their UAE offices. AssoDivers (Greece) has purchased MakaiPlan with the MakaiDTM and MakaiFME modules. Makai is providing software training at their headquarters in Athens in March 2014. Oceaneering (USA) has purchased a second license of MakaiPlan to enhance its submarine cable planning capabilities. KT Submarine (Korea) already owns and uses MakaiPlan, but has recently added MakaiPlan Pro as well. Makai will provide software training in April, 2014 at KTS offices in Korea. NTT (Japan) already owns three licenses of MakaiPlan, but has recently added MakaiPlan Pro. MakaiPlan is a tool to create and edit submarine cable routes, define cables and in-line bodies, define and adjust slack, instantly create RPLs and SLDs, estimate system costs, and generate a preliminary cable installation plan. Multiple planners and designers work interactively on cable installations with easy access to and exchange of project data. MakaiPlan is the world’s #1 cable route planning and engineering software, with over 300 licenses sold over the last 14 years. MakaiPlan Pro is powerful and precise 3D, dynamic simulation software for submarine cable lays. Quickly simulating an entire cable lay in the office at 40 to 50 times faster than real-time enables engineers to identify installation risks and estimate costs; before ever going to sea. The simulations are used to train cable engineers, for pre-lay and post-lay analysis, and to create a detailed Ship Plan to guide the installation. A simulation is a valuable tool for understanding and planning dynamic at-sea situations, such as starts and stops, repeater deployments, and sharp altercourses. MakaiPlan Pro includes the GIS planning tools of MakaiPlan, and integrates seamlessly with MakaiLay, the world’s #1 at-sea cable installation software. Unlike other GIS software, Makai provides installers with a comprehensive set of software tools and training that span the entire cable project, from inception to installation.